These high-quality nostalgic trees WERE a hand-made re-creation of the deco 'Space Age' aluminum Christmas tree of the 1950s. They WERE made to last for many Christmas seasons to come! Each tree came with a two year warranty. 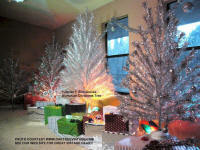 UNFORTUNATELY, ALL THE 'NEW' ALUMINUM TREES SOLD OUT LAST YEAR. THERE WILL BE NO MORE. SORRY. 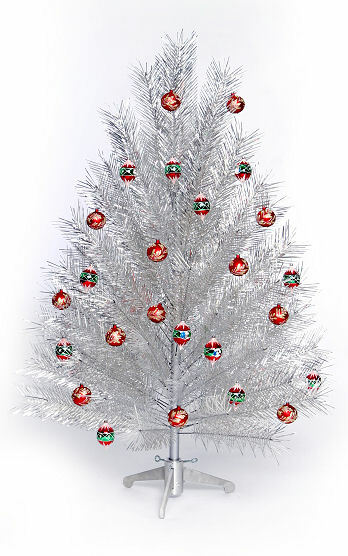 The 7 ft "Classic" Aluminum Christmas Tree is one of our best sellers. It stands 7'6" tall and has a diameter of approximately 54". With 100, 27" branches, this tree is full and really needs little or no decorations to add a festive holiday appearance to any living room. However, the sturdy base and stiff branches hold even the heaviest ornaments. "Just wanted you to know that my friends WANT my Aluminum 'Christ mas' Tree...am forwarding you two of my messages....You have made my 'Christ mas' a very, very happy one this year. Thank You! - Dawn in Woodstock, GA.
"Janice wrote: "Where in the world did you find this? We had one like this when I was a little girl....sweet sweet tree ♥"
& Jan wrote: "Dawn... please share where you found it... I've got to have one!" 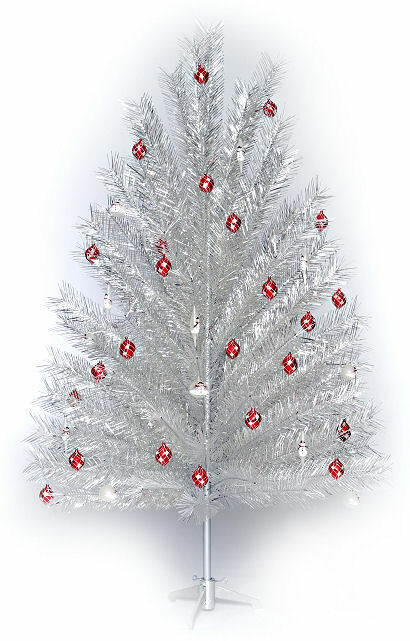 The 5 ft "Classic" Aluminum Christmas Tree is one of our best sellers. It is 60" tall and has a diameter of approximately 44". With 70, 20 inch branches, this tree is full and really needs little or no decorations to add a festive holiday appearance to any normal living room. However, the sturdy base and stiff branches hold even the heaviest ornaments. 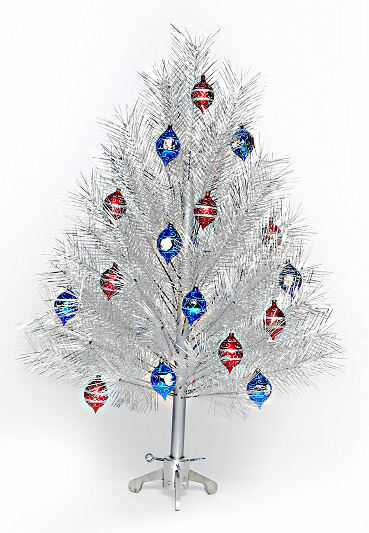 The 4 ft* "Classic" Aluminum Christmas Tree is designed for rooms with limited space. This little beauty is 44" tall x 32" wide with 55, 14" branches. It fits nicely on a coffee or end table and makes a gorgeous sight for those viewing it through your window especially when "Aluminated" with one of our color wheels. Tree is full and really needs little or no decorations to add a festive holiday appearance to any normal living room. However, the sturdy base and stiff branches hold even the heaviest ornaments. The tree comes packed in a heavy duty box with cardboard tubes to protect each branch. We also include a New, Re-Designed, We also include the tubular steel stand with each 7' tree. These stands are amazingly well built from heavy, tube steel, again in the USA. For maximum pleasure and convenience order at least one of our color wheels. ONLY available with 'Tree Orders' shown above! flanked by an original 1960's Pom-Pom tree on the left and another, yet different 6' Pom-Pom tree on the right. 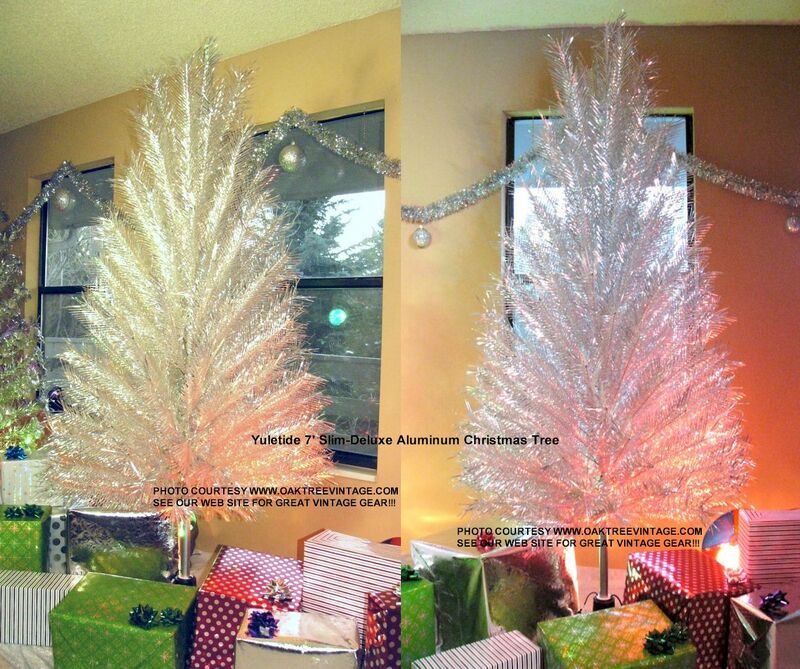 The photos on the right are both of the YuleTide 7' Slim-Deluxe Aluminum Christmas Tree. All 3 trees are in revolving Christmas tree stands. Vintage aluminum Christmas Tree. This is an old, original one with "Pom-Pom / Fountain" style branches. Includes 43 branches (originally had 45, but missing branch not noticeable) and aluminum tripod stand. Stands 6' tall and is ~48" in diameter at the lower branches (branches are 24" in length). One of the more "sparse" looking trees we have had. Branches start ~13" up from the floor depending on adjustment of trunk in stand. Branches have typical wear. We have re-taped the terminations w/ fresh tape. Trunk holes still in good condition. Comes with original box, stand and most branch tube covers. Call to order this tree. These trees are proudly built in the USA. 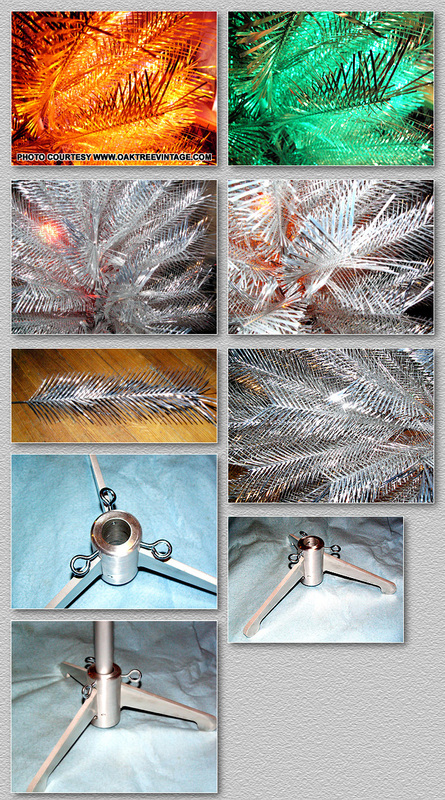 I personally have the 7' Slim Deluxe, 'Stainless' Aluminum Artificial Christmas Tree. WOW! I have sold these for 8 years now. The "stock" photos do not, nor could do them justice. I have sold many "vintage" trees over the past few years. I've had all the classic ones from Evergleam, Peco, StarBand, etc. and while they were all in fair shape for 40+ year old trees, they always had unraveling tinsel on the branches, numerous wrinkled / bent needles, bent branches, worn holes in the trunk allowing the branches to sag, beat-up trunks, bent stands and the occasional missing branch. We would always do a bit of "fix-up" on them, but if the tree had been used a few years and / or had not been packed away carefully, they just always looked fairly "haggard" (no slight meant on the famous, and rightfully so, country singer with the same last name). These new trees are so much better built, and I don't say that about many new versus older constructed things. I am fairly "old school", not because I necessarily pine for the old days, but because I take things apart to see how they're made. Most modern day products are very "disposable" and have been for the past 25 years in my opinion. These new trees are "bomb proof"! 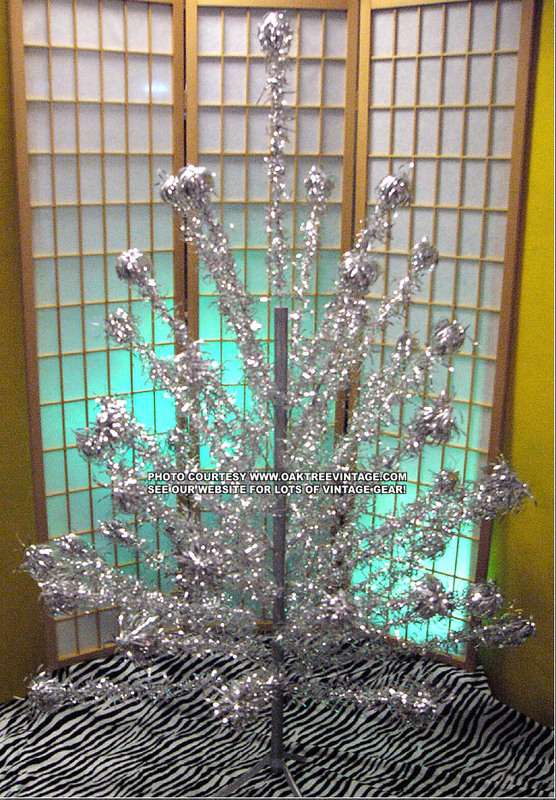 The tinsel is not simply thick aluminum foil. It's much thicker, and springier than any originals I've seen (ie; less likely to bend or crinkle). The needles are longer and the branches have a very cool, "technical" look about their symmetry. They're not just a string of tinsel, haphazardly wrapped around the branch wire. The traditional way of attaching the needle tinsel to each branch is with cellophane (Scotch) type tape. This is how the "vintage" / original trees were done from the 50's & 60's. 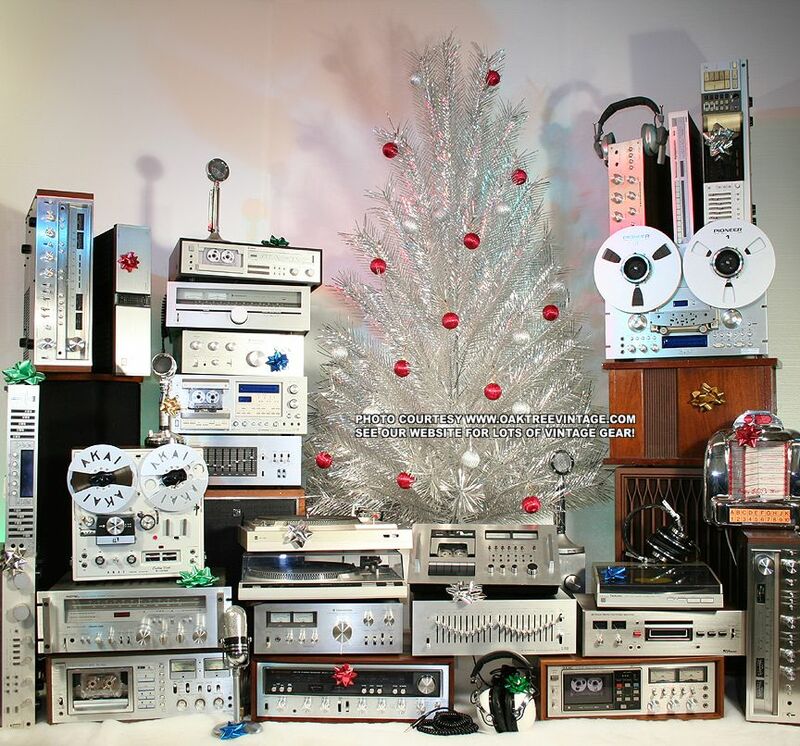 As anyone who has owned or owns an old one knows, the tape has likely long since lost it's adhesive / flexibility properties and are letting branches un-ravel. That will not be the case on our trees. Each branch is not taped, but double welded, at each end to avoid the usual problem of unraveling needles. Also, some older trees had the trunk wrapped with foil to achieve the "silver look". This will commonly be torn / ripped, or un-raveling itself as it was also held by tape, letting the bare, white pine wood show through. The usual fix for this is to strip the foil off, and simply paint them. Our 1.25" diameter, solid wood trunks are completely painted already the entire length to avoid the unsightliness of torn / raveling foil. The "new for 2011" stand is amazing when compared to any original. Instead of simply being "stamped thin steel" that is very light weight and "tippy", this new stand is built of heavy gauge, tubular steel with a VERY wide footprint. It's very heavy and solid and holds the tall 7' and 9' trees to a much more stable degree than any of the original versions. The 5' and smaller trees come with our "billet" machined, aluminum stand. The branches come packed in sturdy cardboard tubes, not the flimsy "butcher paper" that the originals did, thus the branches are much more protected while being stored, and this also expedites packing up for storage at the end of the season in a shipping box that is mean to double as tree storage for many years to come. Finally each tree comes with a 2 year limited warranty against manufacturer defects. Sorry for being so "long winded", but having now seen one of these in real life, I can't say enough about these trees. FYI. 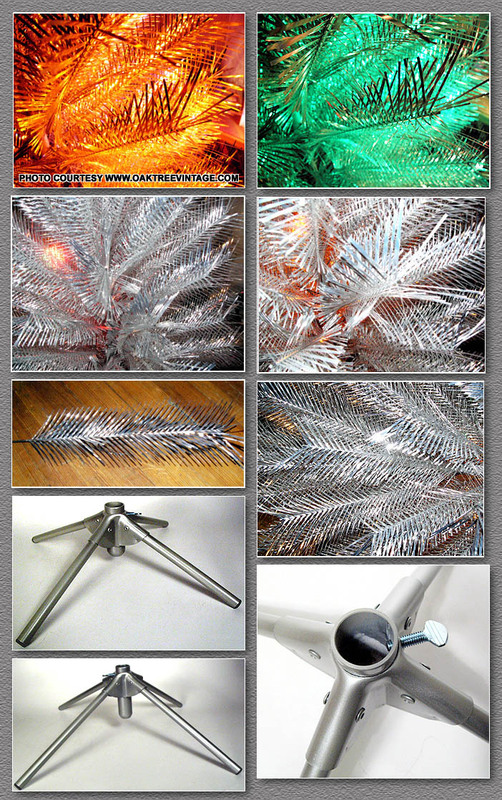 I see some references to "Stainless Steel Christmas Trees". They were never made from 'Stainless Steel', but aluminum.